Are you excited that school is out? Summer is a great time for girls to work on merit badges. With less responsibilities at school, they have more time to devote to other things. 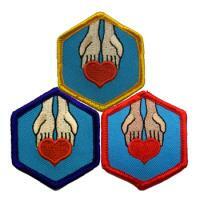 The Family Helper merit badge is a great badge to earn on your own. Not only is it a Stars and Stripes required merit badge, but it is difficult to earn as a unit since most of the work must be done individually. Family Helper Requirement #13 is an easy requirement to complete. Pick 5 chores listed from the AHG Handbook and take responsibility for completing them for an entire month. Each chore does not have to be done every day, but consistently over the month. I have created a simple two page handout to aid in the tracking of this requirement. Click on the picture below to download a printable pdf file. Don’t forget to add your completed forms to you AHG Notebook. This entry was posted in American Heritage Girls and tagged AHG, family, Family Living Frontier, merit badge, printable. Bookmark the permalink.